In my first installment of this year’s Halloween Watchlist, I recommended some funny horror films, and mentioned my love of found footage horror movies. And that list even had a found footage movie on it: “Bad Ben.” So I decided to make this week’s list all about my favorite horror film genre. And while that particular flick was unintentionally humorous, the movies on this list are far from funny. “The Blair Witch Project” may forever be the king of the found footage films, but here are some lesser-known gems that will truly terrify you. For anyone who has even a passing interest in Ghost Hunters, Ghost Adventures, or any of the other paranormal investigation shows, this is a must watch. Sean Rogerson plays Lance Preston, the Zak Bagans-esque host of a ghost hunting show called, yep, Grave Encounters. Lance, along with occult specialist Sasha Parker, psychic medium Houston Grey, cameraman T.C Wilson, and surveillance operator Matt White, are basically actors in an over-the-top, mostly-faked paranormal reality show, a hilarious spoof of the goofiness and melodrama that these shows create in order to bolster ratings. However, for their sixth episode, the team investigates Collingwood Psychiatric Hospital, a completely stereotypical haunted lunatic asylum commonly seen on these shows, and things start getting weird right off the bat, turning Lance and his crew from skeptical actors into frightened believers. It follows the typical found footage formula: things are normal at first, then a little weird, and by the end, all Hell has broken loose. But unlike some other found footage films, this one shows a modicum of restraint, and that’s what truly makes it scary. Sure, you will see ghosts and demons, but the glimpses are fleeting, and the CGI is used sparingly, enhancing the practical effects rather than looking awkwardly out of place or jarring you out of the moment. The acting is strong and realistic, and the little jabs at paranormal reality television are great – I love how the psychic uses a heavy, pseudo-intellectual British accent when he “feels” something supernatural, but is just a regular guy when the cameras aren’t rolling for the show. The ending is solid and disturbing, and nicely sets up the sequel, “Grave Encounters 2.” And like most sequels, I don’t really feel it’s as good as the original, as it sort of has to ramp up the scares and all the restraint shown in the first one is missing, but it’s still worth checking out. In March of 1997, there was a very famous and well-publicized UFO flap over Arizona, Nevada, and Sonora, Mexico, with witnesses spotting large, triangular UFOs almost on a nightly basis. Some of the best footage came out of Phoenix, AZ, and these came to be known as the Phoenix Lights. Even Fife Symington, governor of Arizona at the time, reported seeing “otherworldly” lights in the sky. Skeptics have tried to explain the lights as flares dropped by Air Force planes conducting training exercises, but the this explanation has never satisfactorily explained all of the sightings. 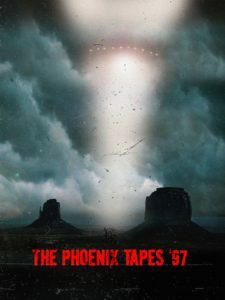 But these true events are what inspired “The Phoenix Tapes ’97.” The film follows four friends as they embark on a camping trip into the desert in their RV, and true to found footage form, one of them feels the need to videotape their adventures from start to finish. Things start out normal enough, just four dudes drinking beer, playing guitar, and hiking in the hot sun. But before you know it, things get weird, and they witness two unidentified flying objects crashing nearby. And of course, everything goes downhill from there, with creepy alien baddies making themselves known, and they didn’t come here in peace. Another great, straight-forward found footage film, with solid acting, a tight plot, and good (i.e., appropriate) CGI. I also dig that unlike most horror movies, where there always seems to be a woman in distress, this starts off as a sort of buddy comedy, and descends into horror, where it’s all of the guys just flipping out as they run for their lives. Good stuff. Who doesn’t love a good haunted house attraction, especially around Halloween? That is the basic premise of “Hell House LLC,” a nifty story about a group of entrepreneurs who set up a haunted house in New York City each year around Halloween and rake in lots of money. The locals pour in, spend their cash, get scared, and everyone has a good time, right? But for the first time ever, the folks at Hell House LLC decide to host their annual event in the abandoned Abaddon Hotel, in Rochester, New York. The hotel has a sordid history, and there are rumors from the townsfolk that unwholesome rituals took place there, and perhaps even murders. And while actually using a house where gruesome killings took place in order to make a profit by turning it into a cheesy horror attraction would seem to be in poor taste to most people, the team thinks it’s the perfect place for their event this year. But wouldn’t you know it, things slowly start getting strange, with clown mannequins seeming to move, a piano playing itself, and a crew member disappearing. This doesn’t phase the Hell House CEO, Alex, though, and he wants to continue with the event as planned, despite the growing fears of his staff. Not a spoiler because the movie starts off with this, but on opening night, 15 people, including the Hell House staff, are killed, due to what police classify as a mysterious “malfunction.” But the tapes recovered that night reveal the much darker story of what really happened. There are lots of good scares scattered throughout this one, and you can never go wrong with evil clown mannequins that move on their own. The ending was a little too clichéd for my tastes, and basically hammers home that there will be a sequel, but they do keep the explanation as to what happened and why just vague enough to keep you interested. This is an odd one, but kept me guessing up until (almost) the very end. Mark Klein, tired of living in noisy, crowded, and busy Washington D.C., decides to move to a secluded house in rural West Virginia. Good thing nothing spooky ever happens down there, right? Anyways, to help him fight his loneliness in his new quiet abode, he records video updates for his friends back home in his OCD support group. And yes, they are definitely running out of ideas to explain why the protagonist must film everything. As per the rules of found footage horror, everything starts off fine: Mark loves his new house, explores the woods behind his home, and proudly shows off the new decor. But before you can say “Tell me where you are, Josh! !,” things start getting spooky, as Mark starts hearing strange sounds in the night. 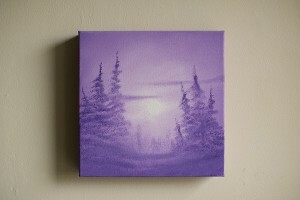 Tree knockings, then a whistle or a hoot, then actual music being played on a flute. Mark grows increasingly angry, convinced that there are drunk rednecks or hunters on his property being obnoxious jerks. He starts making audio recordings from his window, which just confirms what he’s been hearing. He buys a gun, which does nothing to scare off the noises. Then he buys a trailcam, which gets stolen, and buys a subsequent one which has all sorts of weird things happen to it, as he slowly uncovers the mystery of what’s in the woods watching him. There’s also a subplot about him having a crush on a woman in his support group, and she comes to his house for a visit but is spooked by the noises, and subsequently dumps him. It honestly didn’t add much to the film, and I think it actually hurt it. The film’s greatest strength is in how it presents an intense look into loneliness and isolation, and focusing on a single character really lets the viewer feel the terror of being alone while creepy things happen in the woods just out of sight. I honestly didn’t know where this movie would end up. Was it Bigfoot? A psychotic axe murderer? Mothman? Ghosts? The twists keep you on your toes, but the ending is a bit anticlimactic and vaguely unsatisfying. Everything leading up to it is pretty cool, though. Honestly, the movie crawls along here in the beginning and middle. The actors do a great job of making you like and connect with the characters. The dialogue seems natural, the humor seems spontaneous, and the location filming is beautiful (though I fear that now I’ll never get my girlfriend to go to the Pacific Northwest with me…ever). But we, as an audience, are conditioned to expect certain things from found footage movies, and we don’t really get that here. There is some foreshadowing, some insider winks to people familiar with Bigfoot lore, some creepy stories told by the locals, but nothing really scary. No gradual ramping-up of any real tension of any kind. Goldthwait expertly eases the viewer into a state of calm relaxation, which just makes what happens later all the more impactful. And cruel. Because just when you think this may end up being a dud of a horror movie, the couple heads into the woods. And that’s where this movie goes off the rails, from run-of-the-mill into something really special. Jim and Kelly go swimming, find their stuff strewn about when they return to camp, and decide to pack it in for the night. Once they are in the tent, in the dark, the fun really starts. There is a single-take scene, that runs for 20 minutes or so, of the couple just being horrified by sounds in the woods. Tree knocks, whoops, and screams keep them up, and they decide to high-tail it out of the woods in the morning. They get lost, hear more noises, and the ending is truly disturbing, with some interesting callbacks to earlier in the film. Don’t watch this one right before you go camping.